The acoustic session, entitled “Waiting for Federico”; is a work in which Deadpeach re-read their repertoire in an unplugged key, as they had never done before, with unpublished arrangements. The record contains seven songs from their repertoire: Orange Buzz, Silver House, Family and Lies, Cameriere, Le scarpe nuove, Traffic, Stars. Giovanni Giovannini: vocals, acoustic guitar,echoplex. 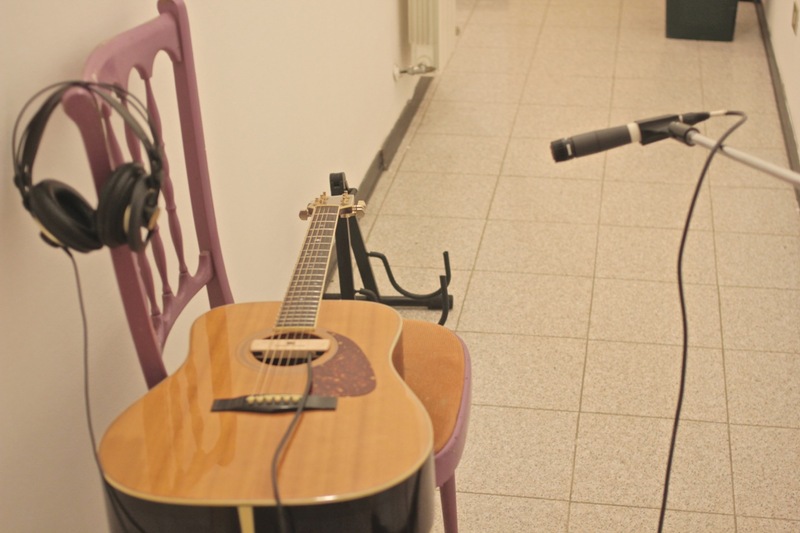 Daniele Bartoli: acoustic guitar 6 and 12 strings, slide guitar, backing vocals. Mr Steveman: bass, backing vocals. Recorded and mixed between February and December 2018 at the Blueberry studio and the Deadpeach home studio. next week we will start the mixing. The album will contain 7 songs by Deadpeach rearranged and played in acoustic. We are traveling to the center of the sun, to recover a crew member, we do not know how long the journey will be. The black sheep has been lost, but we will embark it on our ship again. Deadpeach – set the control - from liquidvision on Vimeo. 2017 for Deadpeach was a sleepy year. we do not know yet, what will be in the pockets of 2018. ‘whatever will be, will be’. 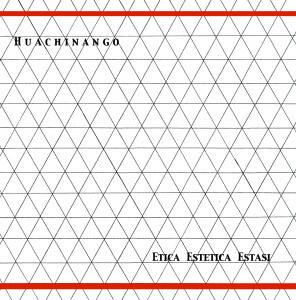 Huachinango is the solo project of Giovanni Giovannini , the guitarist of the band Deadpeach. Minimal electronic music, inner and occult spaces. Vintage drum machines, frequency generator, wired analog instruments and tape recorders. ‘Magic Potion’ is a 1969 song of the band Open Mind. The song has been recorded at ‘Daniele Marzi Studio’ and ‘Deposito Zero studio’ , Mixing at Deposito Zero (2016). by the ‘honorable web-site’ the Obelisk! DEADPEACH – “Aurum”Fuzz addicted di tutto il globo, è arrivato “Aurum”. Il terzo disco dei romagnoli Deadpeach lancia un segnale forte e chiaro: con il fuzz non si scherza. Dopo una promettente serie di demo, l’ottimo esordio “Psycle” ed il meno riuscito “2″ (complice il cantato in italiano, poco adatto a questo genere), l’Universo 7 risplende con cinque tracce che irrobustiscono l’high energy fuzzed rock della band di luminosa psichedelia. Formazione ampliata a quattro (la new entry è il chitarrista Daniele Bartoli) e uscita in vinile con l’agguerrita label berlinese Nasoni Records (splendido l’artwork di Neil Williams) per un prodotto che non ha nulla da invidiare a ben più blasonate e sponsorizzate formazioni heavy psych europee ed americane.La scrittura della mente acida Giovanni Giovannini ha ampliato gli orizzonti dei Deadpeach verso un modello di psichedelia ipnotico-esoterica. Le strutture dei brani, prima scarne e dirette, figlie del modello Blue Cheer e MC5 versione Mudhoney, sono ora profonde, rarefatte, rinnovate da sfumature oniriche e dilatate. Prevale la componente strumentale, le vocals hanno assunto carattere mistico ed evocativo. Lo dimostrano i dieci minuti dell’iniziale “Calcutta”, un trip circolare e senza ritorno che lancia la volata al trionfo totale e totalizzante del fuzz, dominatore di “Gold” e “The Line”, belle mazzate assestate tra capo e collo, in bilico tra stoner e garage. L’atmosfera è slow & cool, meno frenetica del solito: compare persino un assolo di batteria nella lussureggiante “Stomper”, mentre il finale affidato a “Traffic” odora di progressive, California e lotte di strada. 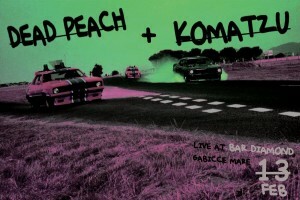 February 2014Deadpeach get radio time ! 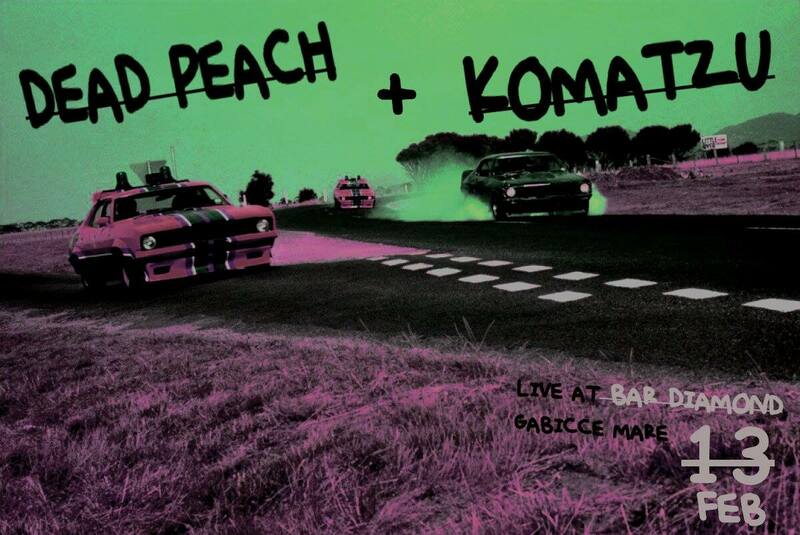 Domenica sera 2 Marzo ore 21 Deadpeach a Restyam on Radio su RnR – Rimini Net Radio! 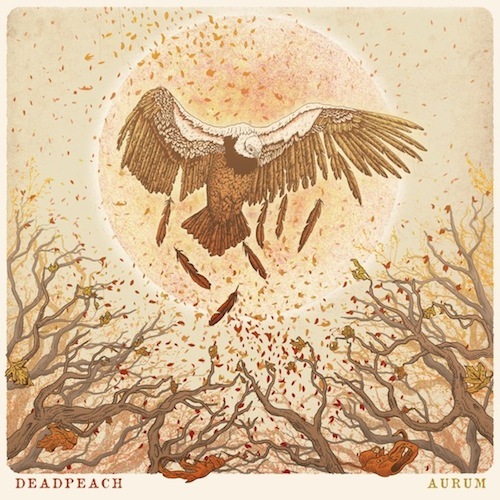 Nasoni Records independent record label based in Berlin, specialized in good psychedelic and rock music, will release on colored vinyl,the new album of Deadpeach titled Aurum ! 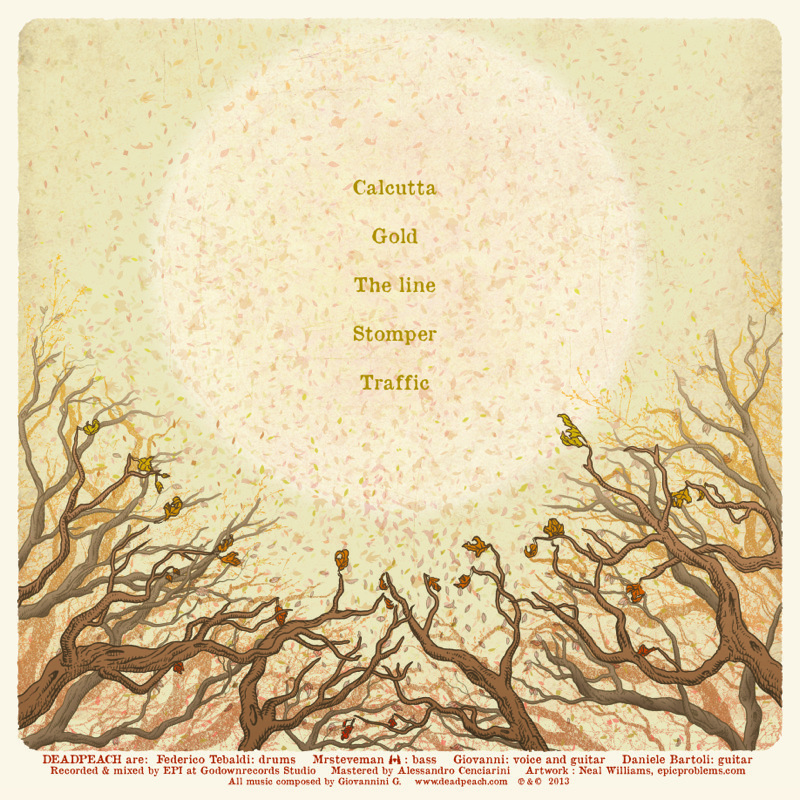 Vinyl version will be available from 1 February 2014!. 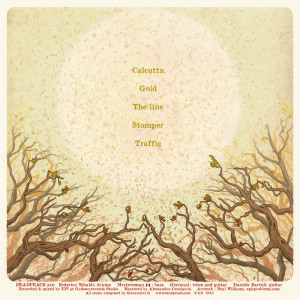 two songs are sung in English the remaining tracks are instrumental. that already has done posters for Soundgarden, Dinosaur jr, Opeth, Neurosis,QOTSA, Melvins and others. From 3 to 4 was a short step! 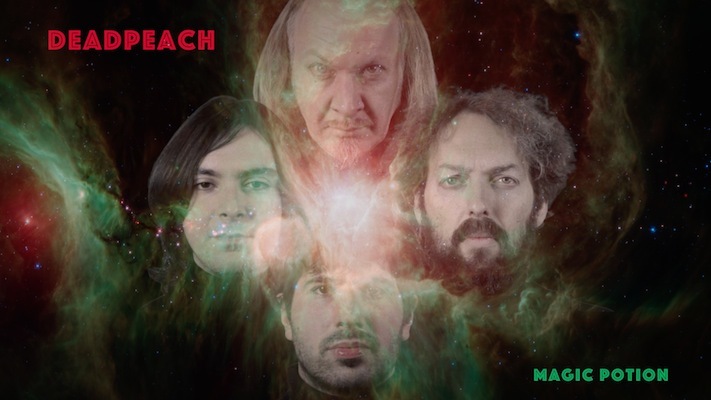 The new guitar hero of Deadpeach is Daniele Bartoli, who took part in the recording of the new album, and now is the fourth man of Deadpeach, the man with the golden gun! Deadpeach are working on the new album. we are mixing the new album and taking care of the graphics ! 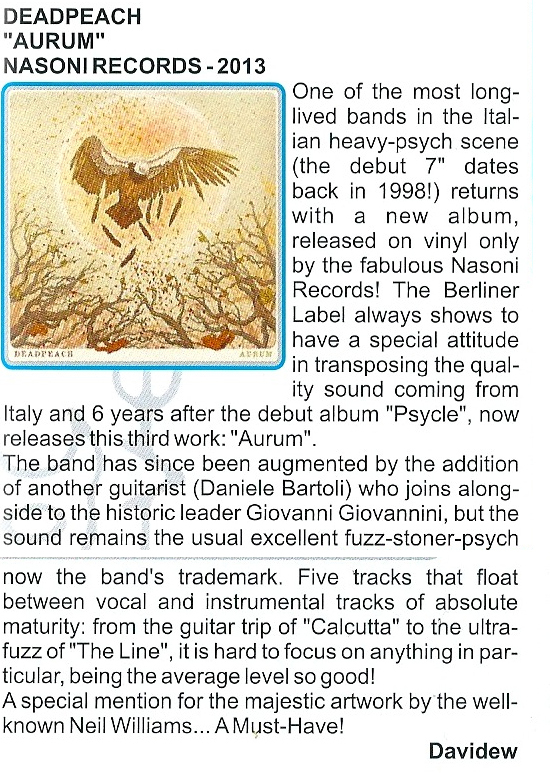 Nasoni Records will release the Deadpeach album titled Psycle on 500 picture disk and 500 black vinyls. with the amazing work of the Art Lab Malleus the vinyl will be not just a 12″, but a highly detailed work of art. Sabato 21 ottobre serata FUZZ ROCK presso ‘LE CLUB’ a Cattolica in viale bovio (in centro), suoneranno dalle ore 22:00 i tedeschi Colour Haze, supportati da ‘deadpeach’ e ‘atomic dog’, a seguito dei concerti , DJ set (70ies rock, groove,sixties vibes) per continuare il party. Ingresso libero. 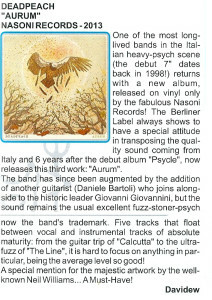 Sono uscite le recensioni dell’album ‘Psycle’: su ‘Blow up’ di giugno, ‘Sonic’ giugno/luglio, la web-zine ‘perkele’ e ‘Rumore’ dove Claudio Sorge ci da 4 stelle su 5. The album Psycle will be released by the label Godownrecords, it will be distribuited by Audioglobe. 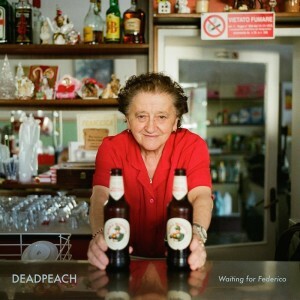 I Deadpeach apriranno i concerti delle date italiane, del tour europeo degli Orange sunshine. L’inverno ancora non molla… cambio alla batteria è entrato Federico, abbiamo abbozzato i pezzi che dovranno finire sul LongPlay, stiamo contattando lo studio www.tamtamstudio.com per le registrazioni.